Well we have a big one coming tomorrow into Thursday early morning. Wow. I am going to start off with the snow map and explain my reasoning for it underneath. As of right now the storm is currently in the deep south and moving northeast toward Cape Hatteras. From there the storm will intensify and rocket to the northeast, giving us a 6-8 hour period of extremely heavy snow (2-3 inches per hour at times). 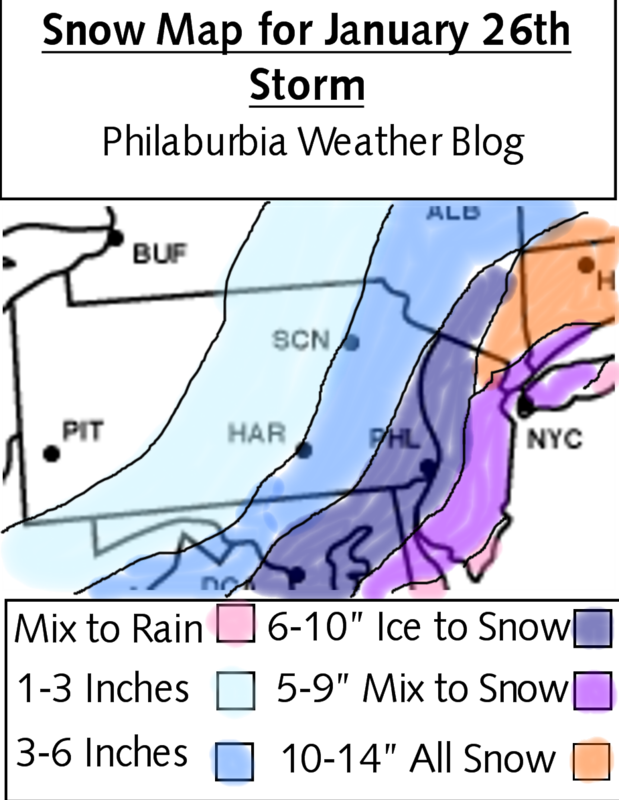 The start of the storm will be an icy mix north of Philadelphia and a rainy mix south of Philadelphia. By the midday period however, temperatures will fall as the storm will start to wrap the cold air behind it. the heavy snow will start by the 4-6 PM range and last until the 2-3 AM range Thursday morning. The evening rush hour will be absolutely atrocious. Thursday won’t be much better as salt and plow trucks will be frantic trying to clear the rapidly accumulating snow off the roads. The snow will be wet and heavy, perfect for a snowman and snowball fights. A hazard with this type of snow will be power outages and falling tree branches. Schools: There will be a decent amount of schools closing early tomorrow. I really think its going to be up to each district to decide whether to close early or not. Thursday most schools should be closed (exception South Jersey). I really do not think the plow trucks will be able to clear the heavy snow off driveways and roads by late morning Thursday. Bust potential: Because we are less than 24 hours out and everything looks in line for a snowstorm, the bust potential is pretty low. There may be some lower totals in some places, but there may be some higher ones as well.